The doctor who failed to spot Baby P's injuries has been suspended from practising, the General Medical Council (GMC) has said. Dr Sabah al-Zayyat, a locum paediatrician, examined Baby P at St Ann's Hospital in London on 1 August 2007, two days before he died. The GMC is currently investigating the doctor's conduct in connection with the 17-month-old boy. He died in Haringey, north London, after suffering months of abuse. The GMC had already placed temporary conditions on the registration of Dr al-Zayyat at a hearing in August 2008 which meant she could only work under supervision. But those conditions have now been upgraded to a full suspension. The GMC said it would hold a full public hearing if its investigation merited it. If it proceeds to that stage it can then either strike Dr al-Zayyat off the medical register, suspend her, put conditions on her registration or simply not impose any penalty. Dr al-Zayyat, who qualified in Pakistan and worked in Saudi Arabia before coming to Britain in 2004, spotted bruises to his body but decided not to carry out a full systemic examination because the boy was "miserable and cranky". A post-mortem examination later revealed a broken back and ribs, among a number of other injuries, that are believed to have pre-dated his medical examination. Last week, the doctor issued a statement through the Medical Protection Society, which gives professional indemnity to healthcare professionals. She said: "Like everyone involved in this case, I have been deeply affected by the shocking and tragic circumstances of this young child's death. "My professional career has been devoted to the care of children. I will co-operate with any investigation to identify whether lessons can be learnt from this case." Baby P died of his injuries despite repeated visits to the boy's home by the authorities. 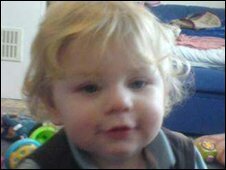 The boy's mother and her boyfriend, who cannot be named for legal reasons, and their lodger, Jason Owen, have been convicted of causing the toddler's death and will be sentenced on 15 December.